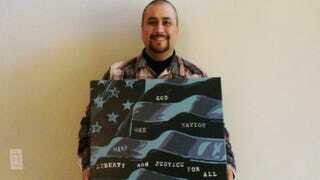 George Zimmerman, the Next Picasso? The art world has a new contemporary to add to its list of budding artists: George Zimmerman. That's right, the acquitted shooter of Trayvon Martin, an unarmed black teen, is leveraging his "celebrity" to hock one of his original works on eBay. According to the Los Angeles Times, an eBay user with the alias "therealgeorgez" appeared earlier this week on the auction site and listed the painting under the "direct from the artist" category. While no news site has confirmed whether Zimmerman is the actual owner of said eBay account, the user posted a photo of Zimmerman holding the created work. The opening bid for the "art" was priced at 99 cents, and as of Wednesday morning, bidding for the painting of the American flag with the words, "God One Nation With Liberty and Justice For All" on the stripes has already pushed past the $100,000 mark. "First hand painted artwork by me, George Zimmerman," is written in the description portion. "Everyone has been asking what I have been doing with myself. I found a creative way to express myself, my emotions and the symbols that represent my experiences. My art work allows me to reflect, providing a therapeutic outlet and allows me to remain indoors :-) I hope you enjoy owning this piece as much as I enjoyed creating it. Your friend, George Zimmerman." Supporters of Zimmerman have bid the item up, posits the Times, as some users have gone so far as to outbid their already winning bid. Some have sent messages of support for Zimmerman that have been posted in the Q-and-A section. One user wrote: "george, pleasee dont leave florida. you are our hero. please run for a political office! we need you. God bless you." Another sais they wished they could afford a Zimmerman original. While the owner of the account hasn't been verified, the controversy surrounding the original work seems very Zimmerman-esque, as the website Mediaite.com has already questioned the originality of the piece posting images of a Shutterstock photo that closely resembles the flag painting that Zimmerman is holding. If the eBay account is "the real George Zimmerman" it wouldn't be the first time that he has traded on his infamy to receive a healthy cash infusion. While on trial for the Martin shooting, a website was created to help pay his legal team. The site crashed because it got so many visitors while managing to collect more than $130,000 in donations from the public, the Los Angeles Times reports. When one user asked if they could pick the item up from Zimmerman if they won the auction, the answer was: "…whoever wins within the Continental United States, will receive this painting delivered by me personally." Read more at the Los Angeles Times and Mediaite.com.